A common problem many of my clients face is manually loading and unloading floor-loaded boxes from a trailer. Typically, one to two operators are required to palletize them in the trailer (a standard ceiling height usually exceeds 8-feet tall), and one operator is required to remove the pallet with a forklift. Handling boxes with various weights and at retrieval heights between 0″ to 96″ above the standing surface, is likely over the recommended guidelines for manual material handling (MMH). As an ergonomics engineer, I work with many Fortune 1000 companies and have been asked for solutions to this common problem. 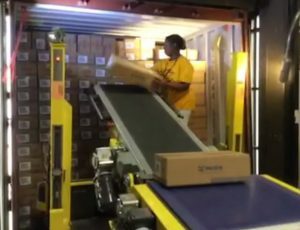 Just recently, I was working onsite at distribution center and was impressed with their use of the Destuff-IT, an assist device/conveyor to help workers manually lift and move containers in and out of trailers. Though not fabricated in-house, it has resolved many of their material handling issues, while also increasing productivity. While standing on a hydraulic platform lift, staged inside the trailer, one operator can control the vertical height and horizontal distance. By pivoting the attached conveyor toward the product, they are able to work within the optimal MMH guidelines. Once the operator loads the box on the conveyor, it is mechanically rolled out of the trailer for palletizing. DeStuff-IT reduces the risk of injury from repetitive twisting and overhead reaching.